Some writers left personal testimonies about the corrosive effects of evolution on their religious beliefs. 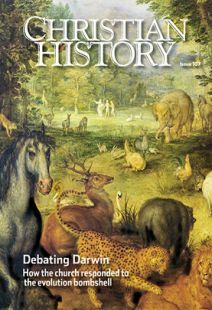 But in many cases, their encounters with Darwin’s theory came as part of a larger journey away from faith. Victorian writer Samuel Butler supposedly told a friend that Origin of Species had completely destroyed his belief in a personal God. But one of his biographers noted, “He had . . . already quarreled with his father [a minister], refused to be ordained, thrown up his Cambridge prospects, and emigrated to New Zealand as a sheep-farmer before Darwin’s book came out.” He quit praying the night before he left for the Antipodes to start farming. Few of Darwin’s contemporaries left evidence of experiencing such spiritual crises. One who did was naturalist Joseph LeConte. Arguably the most influential American harmonizer of evolution and religion in the late 1800s, he took great pride in showing that “evolution is entirely consistent with a rational theism.” But this did not come without a struggle. Actually, it is difficult now to sort out which orthodox doctrines he ditched because of evolution and which ones he abandoned for other reasons. But, by the last decade of his life, he had come to reject the idea of a transcendent God, the notion of the Bible as “a direct revelation,” the divinity of Christ, the existence of heaven and of the devil, the power of intercessory prayer, the special creation and fall of humans, and the plan of salvation. Only an imminent, pantheistic God and personal immortality survived. Yet, despite toying with leaving organized religion, LeConte continued to attend a Presbyterian church. George Frederick Wright was another who traveled this path. Wright, a seminary-trained Congregationalist minister and amateur geologist, emerged in the 1870s as a leader of the so-called Christian Darwinists and a recognized expert on the Ice Age in North America. As a young minister, he read Darwin’s Origin and Charles Lyell’s Geological Evidences of the Antiquity of Man (1863). This view of God’s relationship to the natural world appealed to Wright as an ideal solution to reconciling science and Scripture. He blunted the possible psychological shock of Darwin’s theory by arguing that a theistic interpretation “makes room for miracles, and leaves us free whenever necessary, as in . . . the special endowments of man’s moral nature, to supplement natural selection with the direct interference of the Creator.” He also repeatedly used language that seemed to restrict natural selection to the lower end of the taxonomic scale while attributing kingdoms and broader taxonomic groupings to special creation. Wright did experience a serious crisis of faith in the 1890s, but it came from encountering higher criticism of the Bible, not evolution. “So violent has been the shock,” he candidly reported, “that . . . I have found it necessary to turn a little aside from my main studies to examine anew the foundations of my faith.” Wright emerged from his soul-searching convinced more firmly than ever in the Mosaic authorship of the Pentateuch and in a supernatural view of history, and he turned sharply to the theological right. By the second decade of the twentieth century, he had joined the fundamentalist awakening, contributing an essay on “The Passing of Evolution” to The Fundamentals. Few fellow fundamentalists at that time took evolution seriously enough to spend time refuting it scientifically. A significant exception was Canadian George McCready Price, who at the age of 14 joined the Seventh-day Adventist Church. Adventists commemorated a literal six-day creation by celebrating Sabbath on the seventh day and accepted as authoritative the visions and testimonies of their founder, Ellen G. White. On one occasion she claimed to be “carried back to the creation and was shown that the first week, in which God performed the work of creation in six days and rested on the seventh day, was just like every other week.” White also endorsed the then largely discarded view of Noah’s flood as a worldwide catastrophe that had buried the fossils and reshaped the earth’s surface. During the early 1890s, Price read for the first time about the fossil evidence for evolution. On at least three occasions, he later recalled, he nearly succumbed to the lure of evolution, or at least what he always considered evolution’s basic tenet: the progressive nature of the fossil record. Each time he was saved by sessions of intense prayer—and by reading White’s “revealing word pictures” of earth history. Ronald L. Numbers is Hilldale Professor of the History of Science and Medicine, Emeritus, at the University of Wisconsin–Madison and the author or editor of numerous books on science and religion. This article is adapted in part from Science and Christianity in Pulpit and Pew.